I decided to buck tradition this year and I made a cheesecake for Thanksgiving instead of apple or pumpkin pie. Brandon and I both LOVE cheesecake and he insists that it’s more pie than cake, so in his mind I still made the traditional pie. I used my previous cheesecake recipe, (which IMHO is the best) but modified it by adding melted white and dark chocolate, a method I’ve seen in a bunch of other recipes. If you remember from my previous sojourn into cheesecake baking I had some issues getting it right (it looked undercooked, though it really wasn’t). I baked it a bit differently this time and found this is definitely the right way to do it. Plus I think this new method makes it much more like a real New York cheesecake (or so I’ve heard) because it browns the top and sides slightly. While this method made the top kind of flaky looking (nothing you notice when you are eating it), the cake itself didn’t crack. Get out cream cheese, eggs and cream ahead of time and let come to room temperature. If your cream cheese is really cold this can take 6+ hours. When you’re ready to start baking, preheat the oven to 350 degrees (F). Mix crumbs, sugar, salt and melted butter in a bowl until combined and press into the bottom and about an inch or two up the sides of a 10″ springform pan (springform pan is key, make sure you have one). Apparently, real New York cheesecakes don’t have crust up the side, but I love the crust so I want to have as much as possible. Place in the preheated oven and bake for 10 minutes. Take out and cool completely. Turn off the oven. Add in the sugar, flour and heavy cream and mix on low speed until fully incorporated, about 1-2 minutes. Do not over-mix as this will create more air bubbles which can contribute to your cake cracking. Meanwhile, melt dark and white chocolate in separate sauce pans on the stove. Once melted, remove both pans from heat and let cool for at least 5 minutes. Stir 1/3 of the batter into the pan with the melted dark chocolate. Set aside. Stir the melted white chocolate into the bowl with the remaining batter. Pour 1/3 of the white chocolate mixture into the prepared crust. Drop in spoonfuls of the dark chocolate mixture on top. Pour in the rest of the white chocolate mixture over that. Finally, drop in spoonfuls of the rest of dark chocolate mixture and swirl it all around with a knife, but don’t overmix. Gently tap the pan against your counter a few times to help get any possible air bubbles out of the batter. Place in the oven and turn it on to 400 degrees (F). Bake for 15 minutes and then turn it down to 200 degrees (F). Bake for 3 hours. Turn the over off, prop open the door slightly and let cool for 1 hour. Finally, cover the top with plastic wrap, place in your refrigerator and chill for a full 24 hours before removing the springform pan’s side and serving. That looks sooooo good! I have a great cheesecake recipe, I have never thought about dropping in chocolate, thanks for the idea! Hmmmmm! At last! Someone who loves graham cracker crust as much as me! Wow. That looks amazing! I’m sure no one at your table missed pumpkin pie this year! Looks delicious! I do not make many cheesecakes but my DIL loves them so I may give this one a try for her Birthday. That is one beautiful cheesecake- I’m bookmarking the recipe! I did a pumpkin swirl cheesecake for Thanksgiving, using a gingersnap cookie crust. Unfortunately, my crust stuck to the bottom of the springform pan. I couldn’t get it unstuck! How did your graham cracker crust turn out? @nate: The crust turned out great. I have had that problem with previous cheesecakes before, but never with this recipe. I just make sure to butter the pan A LOT. Lightly butter the bottom of the spring form pan place a piece of parchment paper that has been cut to size to fit the bottom of the pan before pressing in the crust. Slides easily onto a beautiful serving plate. What a gorgeous cake and a fantastic recipe! White chocolate? YUM!!! What an AWESOME looking cheesecake!! This looks so yummy. I am going to make it for Christmas. whent the cake is cooled I will add broken pieces of white chocolate and dark chocolate peppermint bark to the top of the cake & possibly a chocolate sauce too. My goal is Peppermint bark cheesecake so I will adapt your yummy recipe and see what happens. Oh and I made a turtle pumpkin cheesecake for thanksgiving using crushed oreos for the crust it was awesome!!! It will be a new holiday tradition and i hope this one will be too. Wow, that sounds really good. I may have to try that, too! Omg i love chocolate and that cheese cake look yummmmmyy!!!! Your cake is a piece of art! It makes the mouth watery instantly an looks nicely cheesy and discretly sweet at the same time. Pictures also quite professional! Thank you for this recipe, I made it for my sister-in-laws birthday and all you could hear were moans of satisfaction for several minutes when everyone first dug in. Great recipe. Thanks! chocolate liquor, which is what gives it the biter intense chocolate flavor (and color) to dark and milk chocolates. The photo of food makes me really hungry. One thing, don’t gloss over the selection of spices in your recipes. I didn’t think twice about spice until I tried Juliet Mae spice. I got some Ceylon Cinnamon and it was like nothing I had ever had. Find a good spice company, it can really add to the finished product. I came across this recipe a few weeks ago and thought it looked divine. I bookmarked the page hoping I would get a chance to make it. I made it last week and it was one of the most amazing things I have EVER eaten. It was so much better than any cheesecake that I had ever made before or even bought. Thanks! Carrie’s last blog post..Does Cooking at Home Actually Save You Money? Oh my goodness, that looks delicious – can’t wait to try it out. 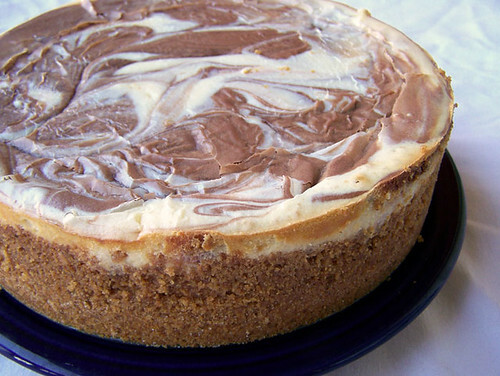 This is one of the very best cheesecake recipes I have made. I would like to do a peppermint version of this, what do you suggest? You should read Desiree’s comment above if haven’t already as she describes adding crushed peppermint and topping it all with peppermint bark, which is an interesting idea. I’m not sure I’d really be into biting into the chunks of peppermint, though. Maybe you could just do something as simple as adding a little peppermint extract to the white chocolate batter (probably only about 1/4 tsp, a little of that extract goes a long way). I have made peppermint bark before and I always use white chocolate instead of dark, so I know the combination works well. And I think the contrast between the peppermint white chocolate and the normal chocolate would be good and the cheesecake wouldn’t be super overpowered with peppermint flavoring. And I’d probably use an oreo cookie crust instead of graham crackers, peppermint and graham crackers don’t sound so great together to me! When you say 5 eggs and 2 egg yolks, is this 5 whole eggs plus the two extra yolks, or is this 5 egg whites and only 2 egg yolks? Okay this looks absolutely amazing. I can’t wait to try it! I want it.. now. Give it. Now. Right now. Hi, I tried this yesterday. It was very good! Shared it on my blog. Looks to die for! can’t wait to try!!!! .-= Richard´s last blog ..Men of Intrigue and Great Meatballs =-. Hii this looks sooooooo yummy.. One question though.. Does this mean I gotta add 40 oz of cream cheese? LOL, yep it has A LOT of cream cheese! I think it’s completely worth having to buy 40 oz because it’s SO thick and creamy. It’s still my go-to cheesecake recipe after 2 years. Everyone loves it! I suppose in theory you could reduce to maybe 4 packages of cream cheese? I haven’t done that, but I imagine it would be ok. I wouldn’t go any less than that, though! Emily… I don’t know if you’ll get this before it’s too late, but umm… I didn’t read the instructions completely until I was in the middle of making the cake… I started making it at 10pm to serve at a pot luck at work the next day around 12pm… I am cooking it the full 3 hours at the lower temp, but it will only be refrigerated maybe 8-9 hours max… what will happen? Should I put it in the freezer? Will it fall apart when I remove the spring pan? HELP PLEASE! I think 8-9 hours is ok. As long you cook it the full 3 hours it will be completely solid, it won’t fall apart or anything like that. I think the extra time in the fridge is more about flavor development, so it may be a bit milder than it normally would be? But that seems more than enough time to chill it through so I think you should be fine. I know I’ve cut into it at around 12 hours before and it was good. I hope you like it! It looks so good! I want to make it for my mother’s birthday since she is a cheesecake fan 🙂 But I have one question. How tall is this cake? I have a 10″ x 2,4″ springform pan. Will it work? Because this cake looks very tall. Thank you!! Yeah, this is a tall cheesecake. But I just measured my springform pan and realized that I’ve been using a 9″ x 3″ pan all this time, when I thought I had a 10″ x 3″ pan. I always have leftover cheesecake so that explains why. So I think in an actual 10″ pan it should be fine even if it’s not as tall as my pan. The cheesecake puffs up a bit, but nothing substantial so you can fill it almost to the top. And if you do have leftover batter you can make mini cheesecakes in foil lined cupcake tins. Bake them at the same temps, but they only need about an hour. Looks so tasty. It’s amazing the variety of cheesecakes that can be made. Yet another for my list. That looks amazing! Definitely try to do at home. Thanks for the recipe! 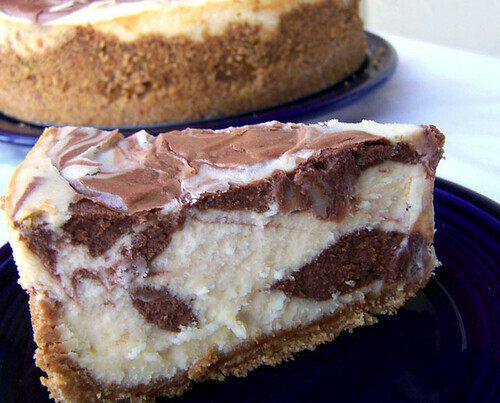 i just made this amazing cheesecake http://t.co/urs7lbSP you should definitely give it a try! Nice recipe! Just couldn’t understand the method very well. You don’t say whether to mix the dark chocolate with the batter or to just stir the melted dark chocolate in the batter. Step six says to pour 1/3 of the batter into the pan of melted dark chocolate. That seems pretty clear to me but I’ll try to update it to be more specific. Thanks for letting me know. I don’t see that you used a waterbath for the cheesecake. Did I miss that or is this a recipe that doesn’t call for a waterbath? 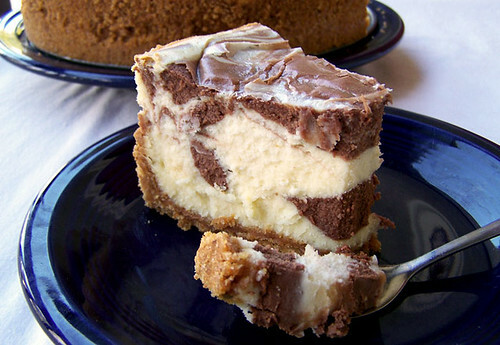 Is it possible to leave out the white chocolate and leave this as a vanilla cheesecake with the dark chocolate mixture mixed in? I would be cooking this for someone who only likes the plain variety and I’d like to add the dark chocolate in case he might want to eat around the yummy chocolate parts. I think chocolate cheesecake is the bomb but apparently I am alone in the opinion in my immediate circle of family. Lovely pictures, by the way!! Your whole website is chock full of wonderful recipes and deliciously tantalizing photos!! Nope, the recipe doesn’t need a waterbath. I think because it cooks at such a low temperature it’s not necessary. I’ve never had a problem with this cheesecake cracking UNLESS I overmixed the batter. Overmixing adds extra air bubbles which will cause cracking so just be careful about that and make sure all your cream cheese is at room temperature so it will mix in easier. Thanks, Dianna! I hope you like it!! I just wanted to make sure that it’s 3 hours to bake? Thank you! Yep, that’s correct. Baking at a low temperature helps keep it from cracking, but it also means you have to cook it for a longer time. The other variations I linked to in the post have instructions for baking in smaller pans if you’re looking to speed up the baking time. Hey there! Not sure if you’re still replying to comments on this post. I love the look of this recipe, but I don’t have a springform pan. Can I just use a regular pie crust for this? Will there be too much batter? Or will it throw off the way it cooks if it’s cooked in a store-bought crust? I don’t think you can make this recipe in a regular pie crust, it would definitely be too much batter. If you half the recipe, maybe you could *try* it in deep dish pie pan, but for best results I really recommend a 10″ springform pan. This recipe can also be made into mini cheesecakes in a cupcake tin. Click on the link in the post to the Cherry-topped Cheesecake Supreme and there are instructions for making mini-cheesecakes in that recipe.